Edmund was born on October 31st, 1848 in Napoleon, Ripley County, Indiana. Edmund's father was Lewis Bachman and his mother was Eleanor F Eaton. His paternal grandparents were Bachman and <Unknown>; his maternal grandparents were Edmund Eaton and Sarah Kenan. He had four half-brothers and two half-sisters, named Amos, Abraham, Wilson, Michael, Loudica and Talitha. He died at the age of 86 on February 13th, 1935 in Kansas City, Missouri. He was buried in Ponca City, Oklahoma. Edmund was named after his maternal grandfather Edmund Eaton. The Eaton family were if English descent and came to Napoleon in 1819 from Steuben County, NY. Members of the family were still in Napoleon in 1970 at the time of the town's 150-year celebration. Edmund grew up in Napoleon and in 1871 married Lydia McKee. The McKees apparently were also one of the pioneer families in Indiana. Her father and mother were born there in 1807 and 1817, respectively. After spending a few years in Southern Illinois Edmund and Lydia returned to Napoleon. Then in 1884 they moved to Conway Springs in south central Kansas. While living there, he became a minister of the Christian Church. Much of Oklahoma was opened for settlement by "runs" in 1889 and 1893. The settlers lined up on the Kansas line and at the sound of a gun rode or drove off to stake a claim for 160 acres of land on a first come first serve basis. Ownership was established by farming the land for 5 years. Edmund participated in the Cherokee Stip run starting at "high noon" on September 16, 1893. He settled on a claim near Jefferson, Oklahoma in Grant County about 30 miles from the Kansa line. In addition to operating the farm he also served as a pioneer minister and established several churches in Northern Oklahoma. He became the first regular minister of the Christian Church at Medford, Oklahoma, the county seat of Grant County. Kenneth L. Bachman wrote (in addition to most of this), "In 1917, at the age of 68, he retired from the ministry and moved to Tonkawa, where we visited them frequently and I carried away many memories. "Particularly, I remember the Edison phonograph which played cyindrical records. Later it was replaced with a Victroa which played the more modern flat records. The records included such items as comedy dialogue by "Uncle Josh", Mr. Gallagher & Mr. Shean, songs by Homer Rhodeaver, Caruso and Henry Lauder, orchestra music by Paul Whitman and marches by John Phillip Sousa. My uncle Clarence, who held a job equivalent to vice president of the Kansas City Paper House, had given the phonograph and records to my grandparents. "In the garage converted from a buggy shed was a Model T Ford with a gleaming copper radiator. The age of the auto was underway and my grandfather had bought his about 1914. Later when I was 5, we bought our first car - a Ford. "Clarence, as noted earlier, was a business executive. George operated the St. Croix Hotel in Wichita, Kansas. His oldest daughter "Mollie" married a farmer and lived in Western Oklahoma. "Three children, Lewis, Ellen, and Albert (my father) died of tuberculosis. Tuberculosis was one of the most common causes of death in the late 19th and early 20th century. A major source of the disease was unpasteurized milk. "In 1925 my grandmother died. My grandparents had been very devoted to each other and it meant a great change for my grandfather who was then 77. He lived about 10 years after her death, dividing his time among his three living sons. His visits provided a chance for me to get better acquainted with him. "When he visited us, he would regularly walk down the creek to where the water was deep and go fishing. Sometimes I would go with him, though I found it boring partly because we fished with a cane pole and a cork and there was little action. Frequently we would walk out to the mail box on the road to get the mail. He would sometimes talk about his life and his philosophy of life. We would often play checkers which he enjoyed, but I never mastered. One of the surprising things I remember his showing me was a radium burn on his stomach from the treatment of a cancer by the famous Mayo Clinic in Minnesota." 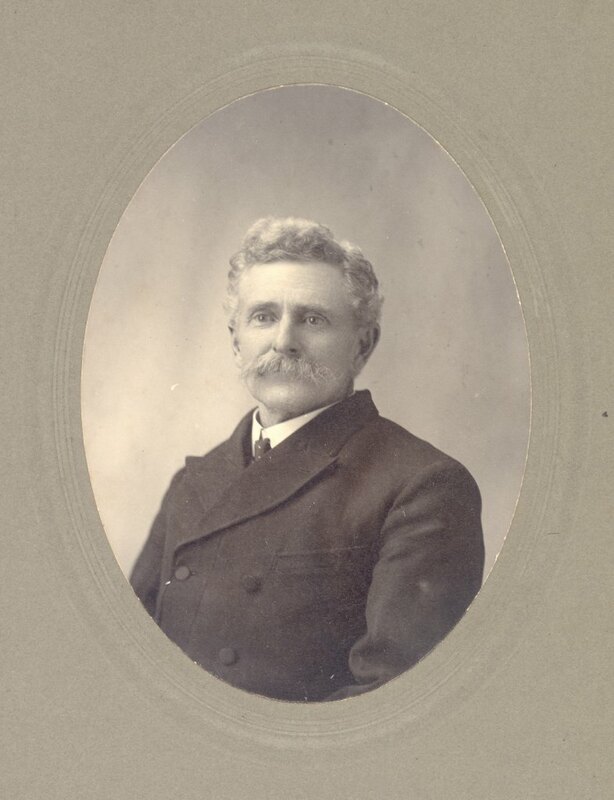 Edmund E. Bachman was born at Napoleon, Indiana in 1848 to Lewis and Elenor (Eaton) Bachman. He went to school there, and as a young man worked as a tanner in his father's tannery. In 1871 he married Lydia McKee, daughter of Samuel McKee. Soon after their marriage they moved to Carmi, Illinois. Their oldest daughter Mary (Mollie) was born there. 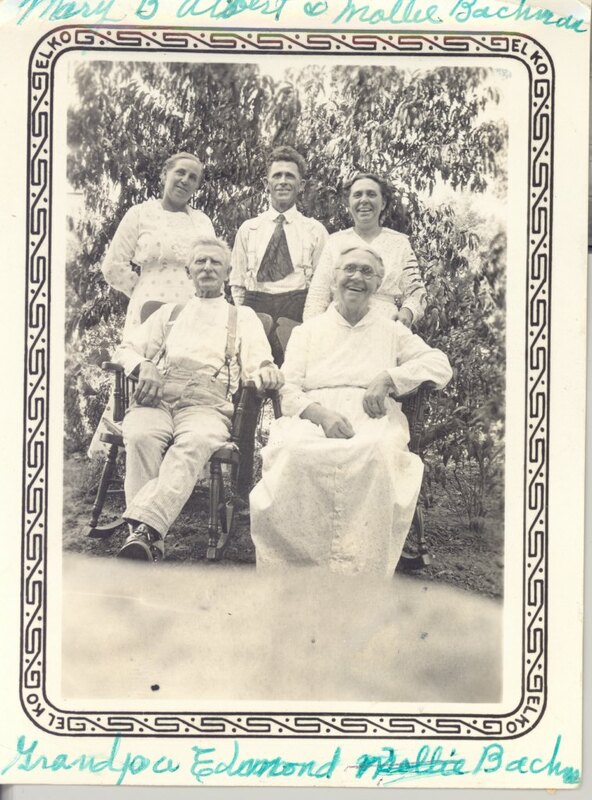 In the early 1870's they moved back to Napoleon, Indiana where their other five children, Lewis, Albert, Elenor, Clarence, and George were born. Then in 1884 Lydia and Edmund made the journey from Indiana to southern Kansas with their six children. The oldest was twelve at that time and the youngest two. They lived on a farm near Conway Springs, Kansas until the opening of the Cherokee Strip in 1893. In the race the Bachmans located on a claim five miles east and one north of Jefferson. Mollie took a claim north of her parents. The Bachmans built a home and reared their family, enduring the hardships of pioneer life. Edmund enjoyed fishing and gardening. The family always had a large garden, and whenever he got a chance, Edmund would slip off with a canepole to the creek to fish. They were a religious family. While living in Kansas he began to preach and continued as a pioneer preacher in Oklahoma. He held meetings in school houses and helped establish several churches over the County, driving a horse and buggy to the places where he preached. He performed marriage ceremonies and conducted funeral services when called upon. His wife remained at home with the family while he was performing these services for the church. The older boys were able to carry on much of the farm work. Edmund was the first regular minister for the Christian Church in Medford. Mollie married Al Riggs and they had two children, but tragedy struck and Al died. Mollie stayed on the claim until she married Tom Wilson and they moved to Woodward County. Lewis died of tuberculosis at the family home southeast of Medford, Oklahoma Territory in 1898 at the age of 23. Albert married Mary Trekell. Elenor married Norman Brown, but she and her young son both died while living southeast of Medford, Oklahoma Territory when she was a young woman, in 1906. They were buried four miles east of Jefferson, Oklahoma Territory. Clarence married Agnes Ferguson and lived in Kansas City. George married Nellie Hughes and lived near Mutual, Oklahoma for a while, then in Wichita, Kansas. Mollie, Lewis, and Albert taught schools. In 1903 the Bachmans sold their farm and moved to Medford to live. While living there, they sometimes went to Eddy to visit the family of their son Albert. This trip took about a day each way by horse and buggy. On such occasions both families would pack a picnic lunch and go fishing on Deer Creek, west of Tonkawa, Oklahoma. 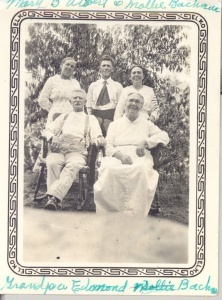 About 1917 the Bachmans moved to Tonkawa. While he was in a gospel meeting in California, Edmund's voice failed and he retired from preaching. His wife Lydia died in 1925. Edmund then moved from place to place living with each of his children for a time. He was living in Kansas City with his son Clarence at the time of his death in 1935, and was buried beside his wife in the IOOF Cemetery west of Tonkawa.